It was just a month ago that I posted some thoughts on Cloud Providers being the CLECs of the twenty-tens and a few days into the New Year look what happens: a cloud provider M&A deal. Here is summary of the deal. I guess the cloud provider consolidation is under way. It appears that the price per user for an acquisition in the cloud services market is $28k per user as of last week. I calculated this price using the Internap/Voxel comp, I assumed 1,250 users and assumed they will get the earn out, but I should really take the time to run the Terremark and Savvis deal comps and maybe I will get to that this week. APKT updated their 2011 guidance this past week to reflect a lower anticipated revenue result. I have written positively about the company in the past. Observing APKT over the past year reminded me of lessons I learned about scaling PE-VC companies. There are real operational barriers when a company approaches and exceeds $75M a quarter. The barriers to growth that emerge around $75M a quarter and into the next revenue band between $75-299M are quite real and often the business activity level required to execute on a 90 day cycle and transition between revenue bands is really challenging for leadership teams. There are marked internal differences between a company executing around $75M a quarter and a company executing at $150M a quarter. As companies organically approach the $75M level it is like a plane climbing to altitude and encountering turbulence. The company has to fly through it and it is going to be bumpy. Leadership teams can (1) go it alone, (2) buy something or (3) find some help by combining efforts with a larger company. “When all the numbers were entered into the model, companies were placed into four revenue bands. These bands were created from my experience on the operating side of the business. The revenue bands were chosen because within each band, the complexity of the business is different and the scale of a company’s infrastructure changes from band to band. I am looking at technology companies in terms of revenues (i.e. market share) because this is how CEOs look at their companies. EPS and operating margins are important, but leadership teams in technology companies think in terms of top line revenues and market share. This is in part due to the cycle of creation/destruction within the technology industry, but also because revenue growth means the possibility of an equity event. There are a few additional reasons why I put companies into revenue tiers. If you accept the World is Flat hypothesis or some variation of the premise that competing in global markets is important, then it is important to consider that only a few companies can compete in all geographic markets in their target technology verticals. Moving between revenue tiers is very difficult. It is the movement between these tiers that produces investment value. To move between tiers requires a (i) technology paradigm shift to be occurring in the broader market or a specific technology sector or the (ii) expansion of the size of an existing market. 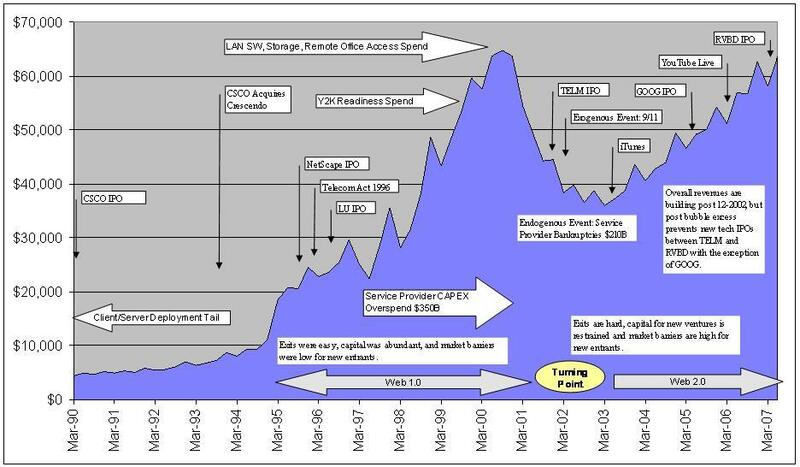 An example of a paradigm shift was the adoption of the client/server model and an example of the expansion of an existing market is the Telecom Act of the 1996 and the creation of ~300 CLECs, ~1300 ISPs and ~15 IXCs. The objective of this paper is to look at the companies in the market and ask: (1) Are any companies moving between tiers, (2) are their any consolidation candidates and (3) are there any macro technology changes that will enable companies to cross tiers? By reviewing my prior thinking on the subject of APKT, it makes me think that APKT would be an attractive M&A candidate for a company like CSCO. I am making a commitment in 2012 to find time to think about problems and not be distracted by the tyranny of the present. This means I am not tweeting, I am not on Facebook, but I am reading and taking time to think about problems and plans. Here is a link to an interesting post on creativity and problem solving. If you are going to watch the video and just want to view the thinking portion then start at the 19 min mark. I fully admit that I use the computer as a tool. I write and analyze data sets on my computers and I use programs to organize data sets, create communications and interact, but I try to guard against time spent doing unimportant and non-urgent tasks. Ideally what I want to be working on and thinking about should be important, but not urgent subject matter. That is one of the reasons I like to write and my writing manifests into books, blog posts and if you ask the people I work with occasional long emails. For me, writing is a method to framing my thoughts and my computer is a tool for this process that I must guard against becoming a distraction and creative inhibitor.